Kids Bike Size Chart: Whether as a means of transport or just for fun – childhood and cycling go hand in hand. When buying a new children’s bike, the appropriate bike size plays a very important role. To find it easily we have prepared an easy to read kids bike size chart selection (by height, by age, by inseam) for you. In addition, you may find all the answer to the most pressing questions for your child to learn to ride a bike in the safest way. Measuring your child’s inseam is the best way to find the right bike size. The correct frame size is the only way to ensure that your child reaches the floor safely and easily with both feet at the lowest saddle height. The decisive factor is the inseam length (inside leg length) of your child. It describes the distance between the floor and the crotch and provides information about whether your child can still reach the floor with both feet at a minimum saddle height of the child’s bike (the contact with the ball of the foot is sufficient!). This contact with the ground on both sides should always be ensured and is particularly important for the first driving exercises, as it provides the child with the necessary safety. The height of your child’s body or the age can therefore only be an orientation factor when choosing a suitable child’s bicycle. Although children with “normal” development have a fixed or narrow relationship between height and stride length, you should definitely take the effort and measure the inseam length yourself. You protect yourself and your child from annoying disappointments. After measuring, look up the suitable bike size in the kids bike size chart above. To measure the inseam, you need a yardstick and a medium-sized book. Your child now stands with his back against a wall without shoes, without pants and possibly also without a diaper. Now align the book or spine vertically on the wall between your child’s legs. Now lead it carefully from below, but with gentle pressure upwards into the crotch. Now measure the distance between the floor and the book spine or top edge of the book and you will get the inside leg length. Once you have measured the inseam, you can look up the corresponding bike size in the kids bike size chart by inseam above. Which frame height should you choose for the children’s bike? In general, no frame sizes are given for children’s bikes, as we know them from the bikes for adults. The suitable size for children’s bikes, on the other hand, is usually defined by the size of the wheels in inches. See the kids bike size chart above. The bicycle saddle is also important in this context. It should be adjusted so that the child can touch the floor with both feet. This double-sided ground contact is immensely important as it provides the child with the necessary safety especially during the first driving tests. A children’s bike that your children don’t like is not a good bike. For this reason, your child should choose his or her new bike wherever possible. This is the only way to ensure a long-lasting enthusiasm for bicycles. For maximum safety, you should also pay attention to a robust frame. This guarantees stable handling, even when things get bumpy. In addition, robust wheels are often easier to maintain and less susceptible to faults. Good workmanship and high-quality components are usually a guarantee for high driving comfort. It is also important that the whole bike fits the physiognomy of your child. Because that’s the only way to feel good in the saddle. In general, the term “children’s bicycle” refers to all bikes for children and adolescents. 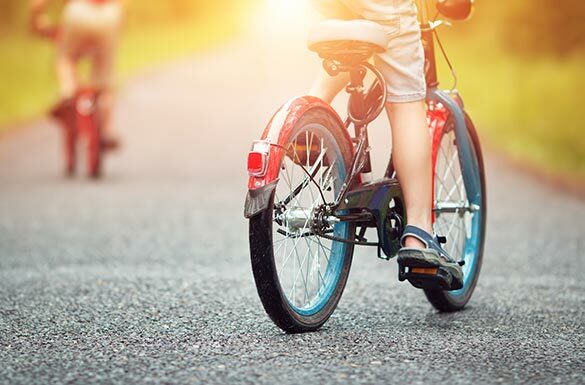 In particular, however, it can also refer to bikes for kids between the ages of 6 and 8 years and then offers an initial orientation in the choice of sizes. To avoid choosing the wrong size when buying a child’s bike, you can use different measurement methods and use the kids bike size chart above. The step length is used to determine the frame height. You can find this out by placing your child against a wall with his back (if possible barefoot). Take a book and lead it up to the crotch. The distance from the bottom to the top edge of the book gives the step length. To determine the right wheel size, you only need to measure your child’s height. For example, if your offspring is between 95 and 100 cm tall, a 12-inch wheel fits perfectly. If your child measures more than 140 cm, you should choose a 26-inch wheel. You will find a table in which you can easily read off the appropriate wheel sizes in our online shop. If you have any questions, please do not hesitate to contact our customer service. Almost everyone knows the problem: Your child always comes home with dirty clothes because pants or shoes have got into the chain. In this case, a chain guard is a remedy that should, if possible, completely enclose the chain. This also reduces the risk of falling. In case of sudden danger, the child should come to a standstill immediately. This requires a powerful front and back-pedaling brake. Make sure that your child knows how to use both brakes correctly. In addition, children’s hands should be able to reach the brake levers without difficulty. Especially when your child is outdoors in bad weather or darkness, the children’s bicycle needs a good lighting system with reflectors. It is important that the bike has a smooth-running dynamo, which the child can activate independently without great effort. Should the children’s bicycle have support wheels or not? Did you know that when using support wheels, the dynamic equilibrium is insufficiently developed? This means that while support wheels give the child a sense of security, they delay rather than accelerate the cycling learning process. For this reason, you should only mount such aids on a children’s bicycle in an emergency, e. g. if your children don’t dare to ride their children’s bicycle because they are afraid of falling. By the way, you can train your child’s sense of balance at an early age with a scooter or wheel. How can I carry my child’s bike on the adult bike? If the little ones are not yet ready to ride a big bike tour, you can use a special pole system, a trailing runner, to attach the children’s bike to an adult’s bicycle and pull it behind you. The advantage: your child can pedal actively and is safely on the road. This is an excellent opportunity to introduce youngsters to cycling at an early age. When installing the pole system, special attention must be taken to ensure that it is installed with utmost care, as this is the only way to guarantee maximum safety. In case of doubt, leave the assembly to a specialist dealer. How important is the back pedal brake on the children’s bike? Bicycles for smaller children are usually equipped with a back pedal brake. Younger children can use the back-pedal brake better and safer. At the earliest with 20-inch children’s bikes, but mostly from a size of 24 inches upwards, children’s bikes are also offered with a derailleur and two hand brakes. In this case, back-pedaling brakes are usually no longer used. When does it make sense to use a derailleur system on a children’s bicycle? If children can go on tours with their parents, then a circuit is useful. It is particularly advisable to use a derailleur system for larger or difficult tours. Let’s put ourselves in the following situation: The terrain is impassable and steep. If the children’s bike has no gearshift, it is very difficult for your children to keep up with you. After all, the parents’ muscles are more pronounced and most adult bikes have gears. Clear advantages for the parents and reason enough to provide the little ones with help and more comfort. Should the child wear protective clothing like a helmet? Yes, absolutely. Children should not only start wearing a helmet as soon as they move with their bike on the road. It is advisable to get the child used to wear a helmet already in the child seat of your bicycle. This makes the helmet a matter of course when the child later climbs onto the bike himself/herself. And to be a good role model, it is advisable that you wear a helmet too. Here is a good source to learn more about kids bicycle helmets. From our own experience, we can recommend parents to start with a suitable running wheel first. While some children get used to it immediately, others only push the bike around for a bit. Children who are a little anxious will not immediately sit down on a running wheel and start riding. It is important that you don’t force the child to do something that he or she isn’t ready to do. This would deprive the child of the joy of cycling right from the start. What is the best way to teach my child how to ride a bike? Before children get on a bike for the first time, it is recommended that they first gain experience on a wheel or scooter. In this way, the sense of balance is trained, which is so important for cycling. This often raises the question of whether support wheels should be used. Although they offer an increased sense of safety at the beginning due to their improved stability, support wheels can delay or even prevent the formation of dynamic equilibrium. However, if your child experiences a lot of difficulty in practicing for a long time or even develops a fear of driving, support wheels can make sense. Should I push or pull my child? In order to avoid crashes, many parents push their child during their first attempts or hold the bike on the rear carrier. In many cases, the bicycle is simply pulled. However, in order to give your children a feeling for cycling, they should be motivated to ride the bicycle completely on their own at an early age. For example, you can easily push the bike from behind to give the child the necessary momentum for the first attempt. You can still intervene at any time if you think a crash is imminent. Make sure that your child is always sitting upright on the bike and that he or she is looking forward. The background: If you run behind the bike, children tend to look for their parents. Here a crash is almost unavoidable. It is better to accompany your child sideways. In this way, the child concentrates on what is in front of him or her and you can intervene quickly in an emergency. A children’s bike should also be serviced regularly in order to offer the greatest possible safety and maximum driving pleasure. Children’s bicycles are intensively used and often passed on to younger children in the family. As a result, they are naturally subject to constant wear and tear. Of course, you can also carry out simple tasks yourself, such as inflating tires or changing a tube. You can do this together with your child in the best case because this way he or she learns the technique of a bike at an early age. More complex work, such as adjusting the brakes, transmission, and handlebars, tensioning a chain or assembling support wheels should be carried out by a specialist. Measuring your child’s inseam is the best way to find the right bike size. It describes the distance between the floor and the crotch. Knowing this measurement ensures that your child reaches the floor safely and easily with both feet at the lowest saddle height. The height of your child’s body and his age can also be relevant factors when choosing a suitable child’s bicycle. After measuring, you can refer to a bike size chart (as provided in this article) to find your child’s suitable bike size. To measure the inseam, you need a yardstick and a medium-sized book. (1) With your child standing with his back against the wall, align the book vertically on the wall between your child’s legs (up to the crotch area). (2) Measure the distance between the floor and the book spine to determine inside leg length. (3) Then, Refer to a kids bike size chart by inseam (as provided above). The ideal children’s bike has a robust frame, which guarantees stable handling even during bumpy rides. The bike should also be made of high-quality components and must fit the physiognomy of your child. 6 Which frame height should you choose for the children’s bike? 10 Should the children’s bicycle have support wheels or not? 11 How can I carry my child’s bike on the adult bike? 12 How important is the back pedal brake on the children’s bike? 13 When does it make sense to use a derailleur system on a children’s bicycle? 14 Should the child wear protective clothing like a helmet? 16 What is the best way to teach my child how to ride a bike? 17 Should I push or pull my child?